Are you a Brooklyn street tree fan who wants to protect your tree from dogs, trash, foot traffic, and ill-placed bikes? Maybe you’ve thought, “I’ll put in a tree guard!” Tree guards are urban heroes if designed and installed properly. But no matter how well intentioned, a poorly designed and placed tree guard can do more harm than good; remember, the health of the tree always comes first! A good tree guard should be 18 to 22 inches tall to avoid posing a tripping hazard. For safety, the top of the guard should be flat or rounded, not pointed. Be sure it’s not a barrier to rainwater; water must be able to flow freely off the sidewalk into the tree bed. Make your guard three-sided, open to the street to allow for car doors. Remember, a tree grows, so give it room by installing your guard at the outermost edge of the tree bed. Don’t pave over any part of the bed or attach the guard to your tree. And never raise the level of the soil around the base of the tree—mounding soil or mulch over the root crown could kill it! Try this easy DIY idea: Drill holes through the tops of four sturdy, wooden stakes or lengths of pipe. Drive the stakes or pipe into the corners of your tree bed. Loop rope or chain through the holes to create a three-sided guard. Learn more by reading Caring for City Street Trees. Note: Installing a guard around any city tree requires a permit. For more information, visit stewardship.nycparks.org. Call 311 to report tree-related problems or hazards, or visit MillionTreesNYC.org. Are you interested in hosting a clinic for street tree care in your neighborhood? Let us know at [email protected]. 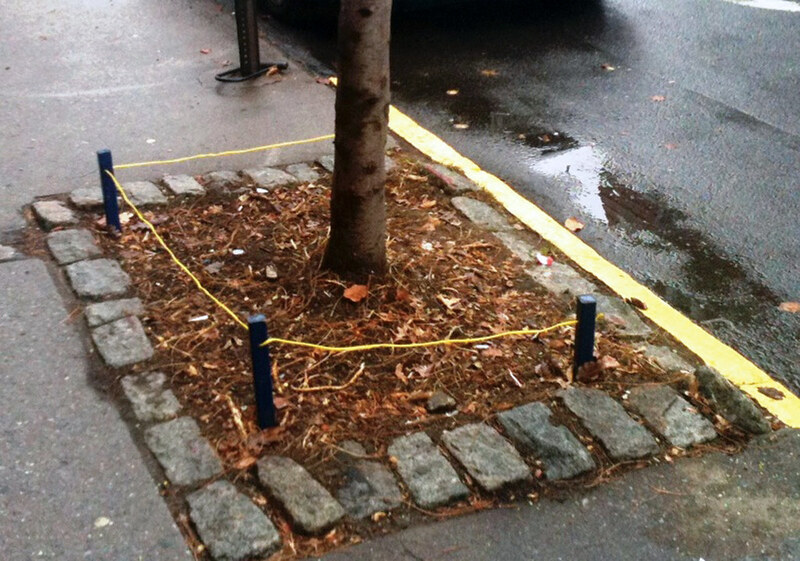 This simple DIY tree guard does the trick on Norman Avenue in Greenpoint. Photo by Greg Todd.